Vera Henley, age 91, gently passed the afternoon of Tuesday, June 12, 2018, at River Valley Care Center in Live Oak, California, with her daughter Ruth and grandson Matthew at her side. The daughter of Grace and Daniel Harris, Vera was born April 14, 1927, in Blackwell, Oklahoma. She was preceded in death by her parents; her husband, John Henley; her sister, Faye; and two brothers, Wallace and Charles. 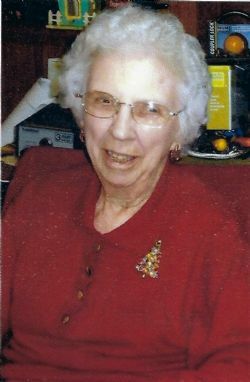 Vera is survived by her children, Ruth Ann Smith (David) and John B. Henley, Jr., both of California; four grandchildren, Matthew Smith (Courtney), Brian Smith (Katie), Sarah Steele (TeJay) and Patrick Henley (Katie), all of California; five great-granddaughters, Kirstie, Lilly, Miranda, Delilah and Olivia; and a great- grandson Carter. Vera�s faith, which was most important to her, allowed her to fulfill a purpose of doing the right thing to the benefit of all. Vera gave generously of herself including both her time and talents to various charitable organizations and worthwhile causes. She spent her teenage years at Live Oak Resort in Pine Valley, California (25 miles east of San Diego) where her father maintained the cabins, post office, and water system. She graduated from Mountain Empire Union High School in 1946 and was awarded the American Legion Certificate of School award for high qualities of honor, courage, scholarship, leadership, service, companionship, and character. After moving to Stockton, California, Vera met and married John Henley on October 26, 1949. They built a life together in Stockton and San Bernardino, California. She held a variety of jobs including telephone operator, retail sales clerk, office manager and partner in her husband�s business ventures. When it was time to retire in 1994, she and John moved to St. Joe and built their own straw bale home. Vera (Mrs. Mayor) worked steadfastly at her husband John�s side to support his vision of making a difference in the community including, building and maintaining the Community Center and restoring the M&NA Railroad Depot Museum. She also organized and participated in numerous fish fries, bake sales, and other fundraisers. After John�s passing in 2015, Vera returned to California and spent her final years enjoying the company of her children, grandchildren and great-grandchildren. Visitation is 6:00 to 8:00PM, Thursday, June 21, 2018, at Roller-Christeson Funeral Home. Graveside service is 11:00AM, Friday, June 22, 2018, at Osborne Cemetery, with Brother Bill Beach officiating. Pallbearers are Walter Arthur, Ben Henley, Orville Henley, Patrick Henley, Brian Smith and David Smith. Alternate pallbearers are Louis Still and Gene Henderson. Honorary pallbearers are Shiloh Arthur, Charles Henley and Kenneth Henley. In lieu of flowers memorials, may be made to the Alzheimer�s Foundation of America, 3222 Eighth Avenue, New York, New York 10001 or Buffalo River Baptist Church Building Fund, P.O. Box 112, St. Joe, Arkansas 72675.